TLDR: 3 of 5 for a compelling idea, well written, but perhaps a little too predicable, and missing that Watership Down quality. 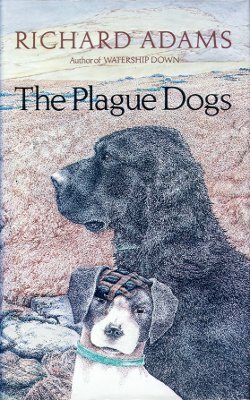 The Plague Dogs is the story of two dogs, Snitter and Rowf, who escape from an animal testing laboratory in the Lake District. Escape is only the beginning of their problems. though, for they're hopelessly ill equipped to survive in the mountainous countryside and winter is approaching. And furthermore, they have no idea where to go or what to do with themselves. Rowf, a black mongrel, was born in the research institute and has never known another life, so he has few expectations and seems driven purely by instinct. Snitter, a fox terrier, is more hopeful, for he once had a loving master and hopes to find one again. In their travels, they kill some sheep, steal food from a car, and eat a dead human when they're close to starvation, and have some close calls with farmers and their dalesman sheep dogs. For a time they hook up with a Geordie fox called 'The Tod' and he tries to educate them in the ways of the wilds, but eventually he leaves them again when they attract to much attention to themselves. Meanwhile, tensions build among the local human population as rumour gets out that these dogs may be carrying the bubonic plague. An unscrupulous reporter from London blackmails and tricks several of the institute scientists for inside knowledge, and then publishes wildly exaggerated pieces in the paper, whipping up sentiment against the dogs and the institute. The government and military are eventually brought in. The end is somewhat interesting, as the author makes it clear it isn't the end he wants for the book, but rather what the public seems to expect. He separates 'public' end from the 'private' end by inserting a poetic colloquy, a dialogue between the reader and the author, in which the reader pleads for the end that they want, but the author questions whether they really deserve it. There aren't a lot of twists and turns in this novel. The dogs mainly blunder through the countryside seeking food and shelter and are largely unaware of their impact. Some interesting twists are the encounters with The Tod (and his fate), the sheep dogs, and the loyal dog of the dead human. In the human realm, things are a little more interesting, but the predations of the reporter and the bumbling of the government are, perhaps, predictable. Near the end the reporter redeems himself, but it's not so easy for the reader to buy, as if the author's heart wasn't into it. If you've seen the animated film from 1982, the ending is close to that which the author was going for. In the book, at least, I think that the author handles the revised ending rather well and leaves the reader room to think. It's clear from the beginning that Adams wants to make a point in this book about how we treat animals, but it isn't always clear how he'll bring that point home at the end. I think he managed fairly well. One of the characters in the end (in speaking to another) even questions the whether the author's method of anthropomorphizing the animals is doing them a disservice, and I like that kind of questioning. It may not have been the ending the author intended, but he pulled it off well, I think, and claimed it for his own. It's difficult to know whether to recommend this book. The writing excellent, and I was reminded of Joseph Conrad at times by the style. It's not as rich in it's fantasy as Watership Down, though, and if you go into it expecting to be exposed to the private lives of dogs, you may be a little disappointed. But the animal characters are lively and well drawn and each reflects their own circumstance well, so they're quite believable and empathetic. 3 out of 5 stars.